Whether you call it Pot Roast or Brisket it seems everyone has a recipe handed down from their Mom, that has a “secret.” They are all so proud and mysterious: “I can’t tell you what it is.” After years of experiments with everything from Manaschevitz wine to Heinz Ketchup, I can now conclude that my very favorite treatment of this piece of meat is the practically the simplest. No ketchup, no wine, no dried fruit; no soda pop, no bay leaves. Really, this has practically no extras; no secrets. The reward: the most incredible, flavorful, fall-apart-delicious brisket you will ever have. Besides the obvious inspirations of my grandmother and mother-in-law, I found Arthur Schwartz’s web site very helpful. Start with your cut of brisket. I like to salt both sides, then score both sides with a serrated knife. Then, I rub both sides of the brisket with olive oil, garlic and pepper. And don’t skimp on any of them. Prepare your dutch oven; I have a 6-quart Le Creuset pan. I make everything in it; and that is why I can only use a 5-lb brisket. Anything bigger won’t fit. The most important ingredients are onions and carrots, onions impart the deep, savory flavor, and carrots the sweetness. The celery adds a subtle flavor but you could leave it out if you don’t have any. Some people add potatoes and other root vegetables; I don’t. Onions, carrots and celery. That’s it, and in that volume order. (You can and should salt the vegetables). Lay your vegetables at the bottom of the pot. Brown your brisket in a hot fry-pan. I used to use my perfectly seasoned cast-iron skillet, until one day it mysteriously broke from being overheated. When you have done both sides, and if you have the patience and coordination, the top and bottom fat edge of the meat; place it in the dutch oven on top of the vegetables. Double-layer aluminum foil, cover, and place in your oven for four hours at 350 degrees. When 4 hours is up, take the pot out of the oven. You will see why you don’t need an added liquid— the vegetables and meat create a delicious savory, soupy concoction often called ‘vetch.’ If you feel you need more liquid, I recommend about a cup of chicken stock– it is sufficiently mild as not to change the flavor. But you don’t need it. Carefully lift the brisket onto a board or cutting surface, and slice thin (you have to slice against the grain, which is a whole other post), then season to taste (might need more salt at this point), ladle with the drippings and place back in the oven for about an hour, or until your guests start complaining from delicious smells causing hunger. Serve with rice, pasta, potatoes or on a big slab of bread. 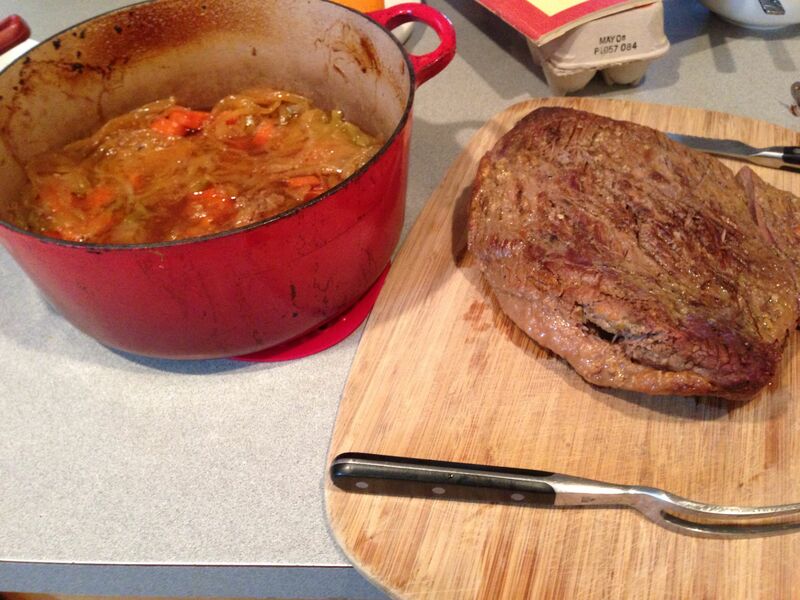 Posted in Meals and tagged brisket, pot roast, Robert deutsch, traditional passover meal on May 11, 2014 by Robert Deutsch.